Boost on the way: The new paediatric ward at Campbelltown Hospital will include a new suite of services and treatments which will mean fewer local kids will have to be transferred to other hospitals. More Macarthur region children will be treated closer to home with Campbelltown Hospital’s new paediatric centre adding a greater range of surgical, medical and outpatient services. Paediatric beds will almost triple from 22 to 60 as part of the NSW Government’s $632 million Stage 2 redevelopment of the hospital, one of the largest health infrastructure projects in the state. 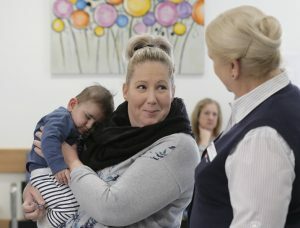 Camden and Campbelltown Hospitals general manager Alison Derrett says the redevelopment will allow for an additional 4,000 children to be treated locally, including those with complex conditions and serious diseases. “I am delighted paediatric surgery will now be available locally for the first time allowing procedures such as appendix removal and hernia repairs,” Ms Derrett said. “Bone and brain scans and nuclear medicine will also be available at the hospital, meaning families will no longer have to travel outside the area for these services. “A new rehabilitation outpatient clinic with specialised therapy teams to treat children with disabilities such as cerebral palsy and developmental conditions will also be available. Other highlights include the addition of close observation beds for more seriously ill children and the expansion of paediatric surgical services, reducing the need for transfers to other hospitals. Extensive consultation was undertaken as part of the clinical plan for paediatric services in Macarthur, including a steering committee with a panel of experts advising on clinical matters. Dr Matthew O’Meara, NSW Chief Paediatrician, agrees with the advice (which included input from former NSW Chief Paediatrician Professor Les White) on what services should be included in the new paediatric centre. “With just 0.5 per cent of children needing to be transferred to a Paediatric Intensive Care Unit (PICU) from Campbelltown, it is clinically appropriate for them to be transferred to the established units at Randwick, Westmead and Newcastle,” Dr O’Meara said. “NSW already has more PICUs than any other state in Australia to treat the small number of seriously ill children who need the highest level of medical care. Much of the focus of the $632 million redevelopment of the hospital is on health care for children. The Campbelltown Hospital upgrade will mean greater capacity to treat more people with paediatric beds tripling from 22 to 60. In 2016-17, Campbelltown Hospital treated more than 38,000 children but only 0.5 per cent of children needed to be transferred to a PICU. Of the total 2,082 children in NSW who spent time in a paediatric ICU, 112 children came from the Camden, Campbelltown, Wollondilly and Wingecarribee areas. The ED will receive a boost, doubling the number of dedicated beds for children from 12 to 24 paediatric spaces. Current outpatient services are seeing a total of 12,527 patients, and this is expected to double after the redevelopment. Close observation beds will be provided for more seriously ill children, reducing the need to transfer patients to the Sydney Children’s Hospital Network. Nuclear medicine will be available so children no longer need to visit other hospitals for PET scans and appointments. Children suffering seizures or bone infections will receive care locally as bone and brain scans will be available at Campbelltown Hospital, meaning families will no longer need to travel to other hospitals. Transition Care Services will ensure seamless care for children who are moving into adult-based care for lifelong medical conditions. New facilities such as 12 new consulting rooms, eight assessment rooms and a new allied health gymnasium and playroom.